PRICE REDUCED, MUST SELL NOW!!! This 1976 44’ Camper Nicholson Ketch designed by Raymond Wall is the number 2 hull of 8 built that year. These fast sailing ketches are well known and sailed all over the world. Extremely well built fiberglass hulls with cored decks, a long comfortable cockpit and two full staterooms with two full private heads make these strong world cruisers very popular and hard to come by. Saint007 has sailed all over the world with the last owners and is ready to go again, but at this low price she will not last long. This easy to sail vessel comes well equipped with older but working electronics, 3 sails in good condition, a large generator for all cruising electrical needs, a huge 110V Offshore Labs 500 GPD water maker, good sized tankage, comfortable sleeping berths for 6 or more and lots of windows and hatches to bring in light. Her five and a half foot draft is perfect for straight tracking at sea and shallow enough for the Bahamas and Keys. As with all older sailing vessels there will be some items that will need to be addressed, but the previous owner had done a complete bottom job in 2008 and had the hull painted while she was on the hard. 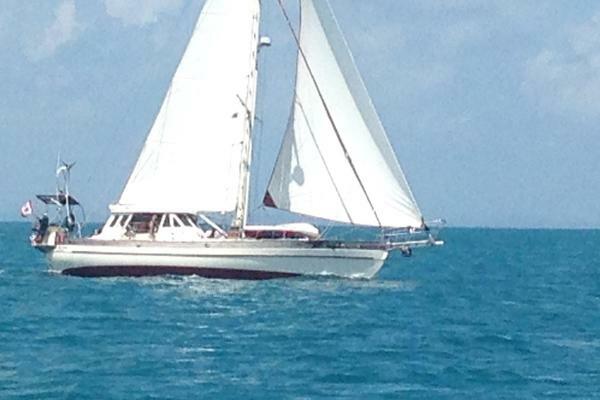 If this documented open ocean cruiser is what you are looking for, call us today and set up your personal preview. Enter the vessel from the centerline companionway and down the ladder you will find the navigation station to starboard followed by a convertible L shaped settee with storage under and behind. Moving forward is the pocket door entrance to the guest head with new Aqua Marine toilet, shower and sink, mirror and storage cabinets. Forward find another pocket door offering full privacy for the head and entrance into the forward guest stateroom offering storage lockers, under berth storage, V-berth mattress with filler and overhead hatch. Returning aft into the salon you will find the straight settee to port with storage behind and under as well as a great place for your flat screen TV. Continuing aft you have the walk through galley to port with 3 burner propane stove and oven, deep SS sink, long counter top and storage to starboard with shelf, stainless steel refrigerator, hanging locker and entrance into the master stateroom with queen size athwart ships berth, ample storage all around with access to the well insulated aft lazerette housing the diesel generator in sound shield. Moving to starboard is the master head with toilet, mirror, multiple storage cabinets, sink and shower. There is also a large access hatch to the engine room in the walk through. Saint007 sleeps 7 owners and guests and has 2 private heads with showers. 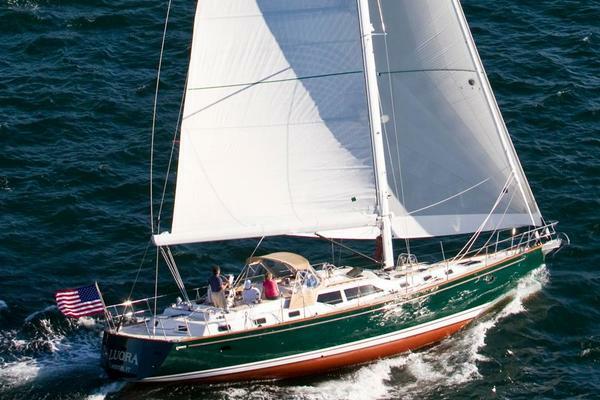 This 1976 44' Camper Nicholson Ketch designed by Raymond Wall is the number 2 hull of 8 built that year. These fast sailing ketches are well known and sailed all over the world. Extremely well built fiberglass hulls with cored decks, a long comfortable cockpit and two full staterooms with two full private heads make these strong world cruisers very popular and hard to come by. Saint007 has sailed all over the world with the last owners and is ready to go again, but at this low price she will not last long. This easy to sail vessel comes well equipped with older but working electronics, 3 sails in good condition, a large generator for all cruising electrical needs, a huge 110V Offshore Labs 500 GPD water maker, good sized tankage, comfortable sleeping berths for 6 or more and lots of windows and hatches to bring in light. Her five and a half foot draft is perfect for straight tracking at sea and shallow enough for the Bahamas and Keys. As with all older sailing vessels there will be some items that will need to be addressed, but the previous owner had done a complete bottom job in 2008 and had the hull painted while she was on the hard.